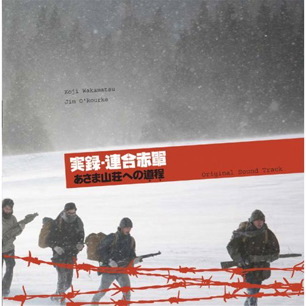 The thirty-fifth Soundtrack of the Week is the music from Koji Wakamatsu's United Red Army, scored by Jim O'Rourke. O'Rourke plays a lot of different instruments and also sings on the last track, a song called "Pictures of Adolf Again". Karen Waltuch and Chris Corsano are among the other musicians. I really loved listening to the whole thing except the last track, the song. I think it's very well done, it's just not my kind of thing. There are some spooky/bluesy solo guitar pieces, delicate ensemble playing and, in what I assume is meant to evoke the soundtracks for Wakamatsu's infamous political pinku movies from the '60s, some free jazz and psychedelic rock. Harakashionna (A Womb to Let) is by a band called Jacks, who sound like they're Les Rallizes Dénudés making a surf album. Tenshi no kokotsu (Ecstasy of the Angels) has what sounds like a Cecil Taylor-inspired piano trio (the Yosuke Yamashita Trio) combined with some moody pop songs. Shinjuku mad (Shinjuku Maniac) is mostly a psychedelic rock assault by a band called Food Brain, though there are some mellower blues and jazz tracks.